Sunday June 23rd 1901 I was busy about the work and read some in the forenoon. Will and I were down to Woolfs a little while in the afternoon. Monday June 24th 1901 We got an early start, did some baking and the washing and went over for strawberries. In the afternoon ironed and put up the berries Tuesday June 25th 1901 I did some work in the garden and got the dinner started, took a lunch and went over on Summit St for cherries, got home at three oclock and got them all seeded by bed-time. Will went to the valley today as did Hattie & Ida Weather very warm. Wednesday June 26th 1901 I put up the cherries and got the dinner ready. I went down home to spend the afternoon. Will cut some hay for Will Woolf. Weather very warm. 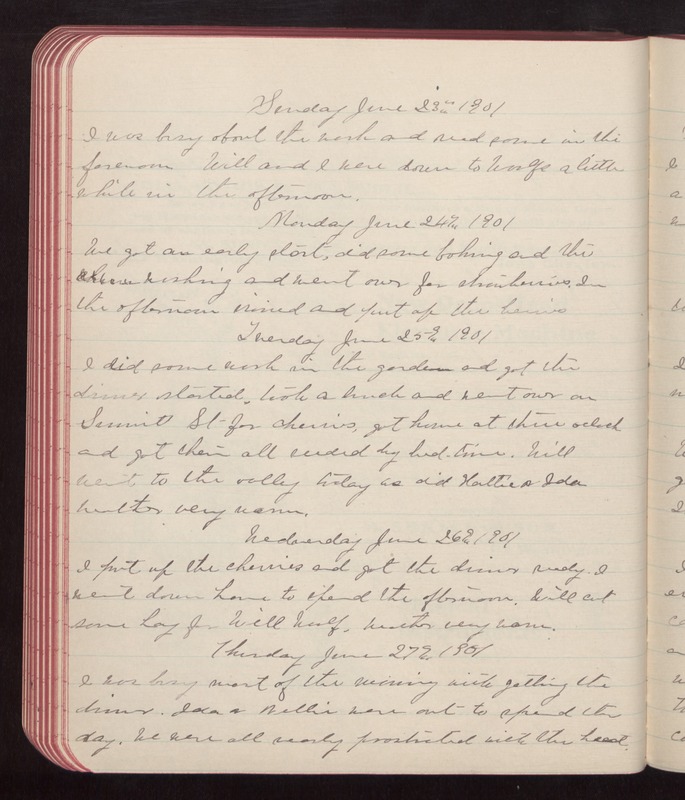 Thursday June 27th 1901 I was busy most of the morning with getting the dinner. Ida & Nellie were out to spend the day. We were all nearly prostrated with the heat.